I’m always wary of songs that have the word “Jesus” in the title. Growing up, my family attended church only a handful of times and the reasoning behind it was that we didn’t like to be preached to. It’s not that we didn’t believe anything – a common misconception of the non-believer or agnostic. It’s just that we have our own idea of what higher power means, whatever that may be. 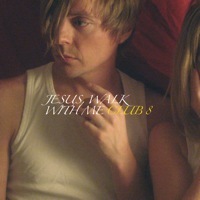 “Jesus, Walk With Me” was the first song I heard off last year’s The Boy Who Couldn’t Stop Dreaming by Club 8 (MySpace). I was happy to hear it then – the tune was slightly reminiscent of my favorite by the Swedish duo, “Love In December”, off their self-titled full-length. The first half of the Jesus, Walk With Me single follows suit. That half includes the equally acoustic “What I’m Dreaming Of Is Something I Could Have” and the dreamier, dronier “Take Me Home”. The final two tracks are remixes of the title track, per the usual from Labrador Singles. Also not surprising is one by Jimahl; the other is by recent FensePost feature band The Sound Of Arrows. The latter comes first, and is poppy enough to be an original Club 8 tune with exception to a bit more electro elements than the group typically includes in their tracks. The latter, like other Jimahl remixes, features little of the original instrumentation fronted by a tweaked version of the vocals. It’s hard to express how much Labrador Records has influenced my listening habits since the turn of the century. I have no question about their status as my number 1 label, and Jesus, Walk With Me, along with the rest of their recent releases, simply proves its prestigious position.